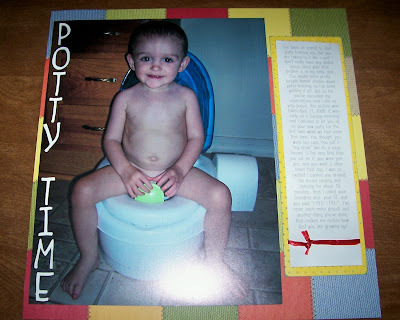 I can't believe almost another week has passed since I've blogged! I've had all of this new stuff to show you, but boy I am really slacking! I'm a bad blogger! :( Sorry! Here are some of the new goodies I bought when I took myself shopping to try and feel better! And guess what-it totally made me feel better! 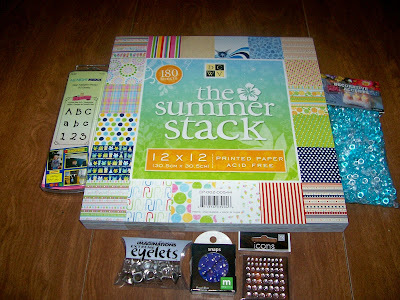 :) I got the new DCWV Summer Stack, some "skittles", some bling, really cool silver eyelets, some blue snap eyelets, and some adorable acrylic alphabet and number stamps. They were on clearance at M's and I got them for $3! Woo-hoo! 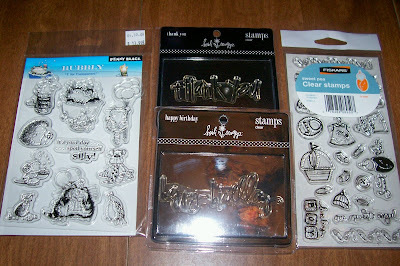 Next are some new stamp sets I bought! I got the "Thank you" and "Happy Birthday" Heidi Swapp stamps, the new Fiskars Sweet Pea set, and the cutest Penny Black set. Isn't it adorable?! I wish I could take a better picture-these are so cute! My favorite is the fat cat in the top at the top!! Next is some of my yard sale goodies from the past few weeks. I am in love with yard sales! As you can see, I only end up buying things for the boys, but that is ok! It makes me happy! I've gotten a ton of cute clothes this year for both boys, plus I got Aaron a pair of Thomas snow boots (that he's been wearing around the house! 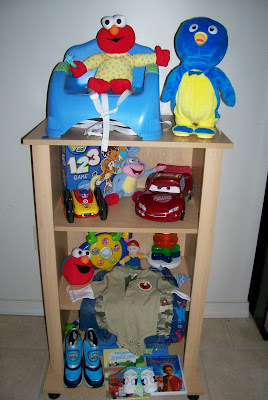 ), Alex got a pair of brand new baseball booties, plus I got that adorable shelf for his room for only $10. Aaron also got a booster seat, a singing and dancing Pablo from the Backyardigans (for $0.50, can you believe that?! ), a Diego counting game, a Lightning McQueen car and a few other things. Alex got an Elmo and cookie monster giggle ball, a light-up stacker that sings, and a talking baby Elmo. For all of this I spent about $21.00. Everything is in perfect condition too, otherwise, I don't buy it. Not bad, huh?! 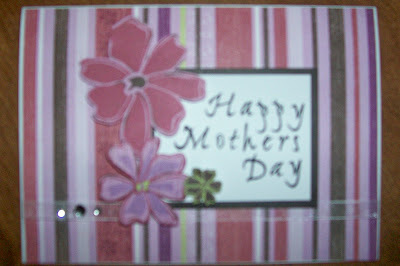 Here is one of the cards I made for Mother's Day. Sorry its so blurry. I used Deja Views patterned paper for the background and for the flowers that I detail cut. They are also pop dotted. The black mat is Cuttlebugged with the Swiss Dots folder, and I stamped "Happy Mothers Day" with MME acrylic alpha stamps. I also added some sheer white ribbon and some bling of course! I made this card with different alterations for my grandma, my mom, and my mom-in-law! 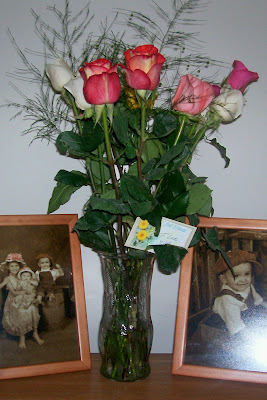 And my last picture for the day-I came home to a dozen beautiful roses yesterday! Aren't they gorgeous? The photo does them no justice-they are so pretty! There are white, light pink, dark pink, a gorgeous pinkish-red, and some yellow ones. Jamie said Aaron helped him pick them out, and Aaron picked the yellow! (Its the only color he knows!) A very nice surprise after a long, stressful day! Well, that is all for now. 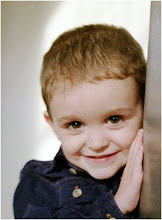 I have today and tomorrow off-YAY!- so I am spending the day with my main man! This morning we went and had breakfast at Shoney's with my Grandma, and now we are just relaxing. I am hoping to clean a little, plus work on Alex's room a little more. Then when Aaron takes his nap, I'm going to play in my scrap room! I hope you're all having a wonderful week! Thanks for stopping by! Beautiful flowers (how sweet), cute layout (when he gets older, your son will never forgive you for taking and scrappin' that photo!! ), I love the Mother's Day card, and what fun goodies you bought! Goodies make me happy too, especially when I find bargains! Holy moly on the yard sale finds. When my girls were younger, I was the garage sale queen with Little Tikes toys for them. You should have seen the stuff I got for them. Garage sales are SUCH a bargain! I'm going to some sales tomorrow . . . I can't wait! Enjoy all of your fun stuff and enjoy your days off! Wow! Some great goodies! Can't wait to see what you do with them! I love your Mother's Day card and the SB page! Fantastic job, Becky!